The latest version of Windows Live suit of products, Wave 3 Beta, is available to everyone now. The Wave 3 beta include Windows Live Messenger 9, Windows Live Movie Maker, Live Mail with Calendar synchronisation, Live Writer, Live Photo Gallery, Live Family Safety and the Live Outlook Connector. Liveside.net has gathered the links available on Microsoft servers and posted on their blog. 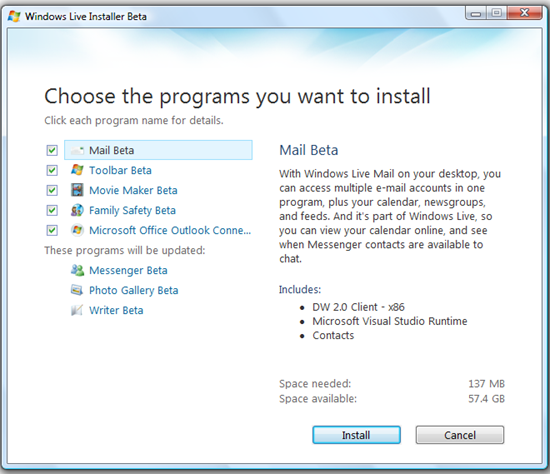 Here are the links for you to download Windows Live Wave 3 Beta in two flavours – Online installer and Offline installer. If your computer can be connected to internet during installation download the Online Installer setup. If you want to install the beta on a computer that is not connected to Internet then download the Offline Installer and transfer the setup using USB devices. Out of curiosity to have hands on with all the products I decided to install all the application of Windows Live Wave 3 beta. Downloading of 134 MB took couple of minutes on my broadband connection and the Windows Live Wave 3 installer launched pretty quickly. 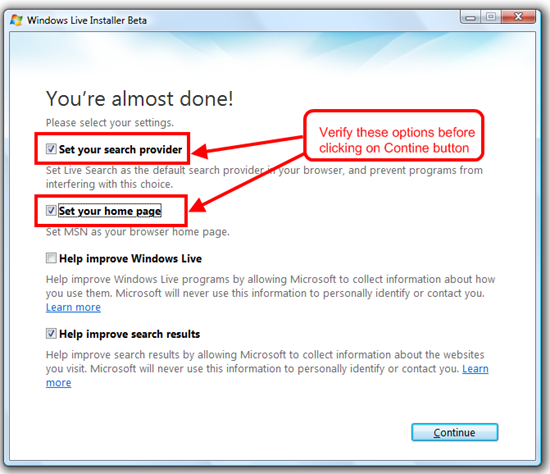 The previous versions of Windows Live Installers use to take very long time to scan and identify the products that are already install on the computer. But the new installer performance is improved drastically. The installer was almost instantaneous in identifying the existing products on my computer and preparing the list of new products that needs to be installed. Installation took few minutes and again I noticed the improvement in the speed of the installer when compared to previous versions. At the end of the installation, the installer tried to change my browser’s Search Provide and Home Page to Windows Live by setting them as defaults. But I unchecked the default option as I don’t want to disturb my current browser settings. Clicking on Continue button prompted to restart the computer to apply the new installation changes. Windows Live Messenger user interface and functionality has been improved a lot. Many intuitive user interface options are making the product easy & fun to use. Window Live Photo Gallery‘s face detection features is very nice. I love the way it is identifying the faces and simple interface to tag names to the identified face. And another best feature is it integration with Windows Live Contact, while tagging faces in pictures we get access to all the contacts stored in Windows Live/MSN/Hotmail account. I’m blogging this post using the new Windows Live Writer. The look and feel of the application is changed to be inline with the rest of Wave 3 beta products. An additional feature in the new version is it ability to directly upload videos to YouTube and embed them in the post. Microsoft is improving drastically. Yes they are listening to the customers who are shouting at them and reacting in a good way. After feeling heat of tough competition from Apple & Google and in fact loosing the web battle to its competitors, Microsoft is waking up and putting all the efforts to catch up the race. Windows Live Wave 3 beta products shows the sign better integration between Windows products and intuitive user interfaces. I strongly recommend you to download and have a hands on with the new products.